This year’s republican judicial primary had a recent “surprise twist.” One of the candidates, James Mosser, switched races from the 380th (with a crowded field) to the 401st. The 401st District Court was not an open bench, but rather it is presided over by Judge Mark Rusch. This years election will be held during the May 29, 2012 Republican Primary. The 401st District Court is a general jurisdiction court. It hears Family Law matters (divorces, child custody cases), Felony criminal matters, and civil matters. The court was created in 2000 at which time Judge Mark Rusch was appointed. He has presided as the sitting judge since then. He has been re-elected twice, although I do not believe either time was contested. Looks like Dallas is jealous of Collin County’s Shenanigans. We all know that Collin’s DA indicted and convicted a judge here. Now Dallas wants to get in on the action. Below is the article of the Dallas DA trying to charge a Dallas Judge. 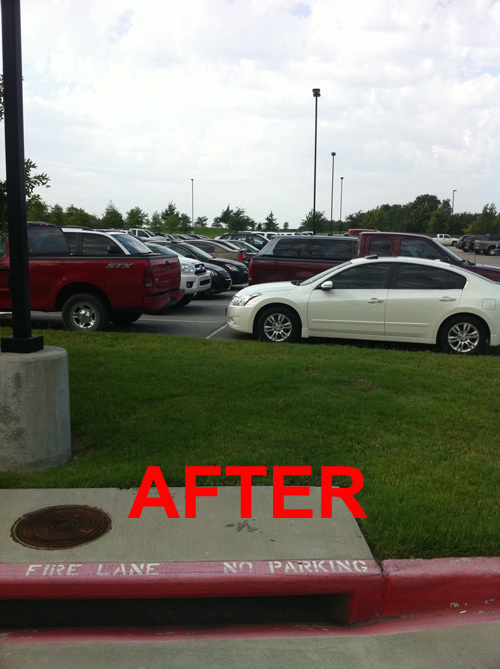 It was a sad day in Collin County. Yet another innocent person was convicted of a crime based on circumstantial evidence and the testimony of an admitted felon and child molester. On Friday, Judge Suzanne Wooten was convicted of 9 counts of bribery, money laundering. 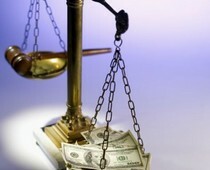 Judge Wooten allegedly took money in return for a promise to give favorable rulings. I guess I shouldn’t be surprised. In a county and era notorious for overzealous prosecution, observers might already be hardened to the notion of innocent people being convicted of crimes. – Nationally there have been 280 DNA exonerations. 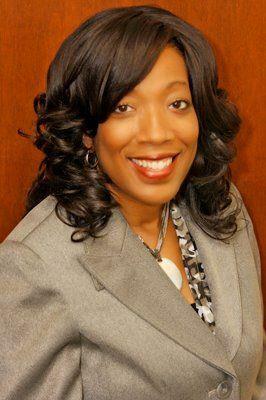 Angela Tucker has practiced civil, family, and criminal law. After spending four years as an Assistant District Attorney in Collin County, she opened her law office and currently is a solo practitioner at Angela M. Tucker, PC. 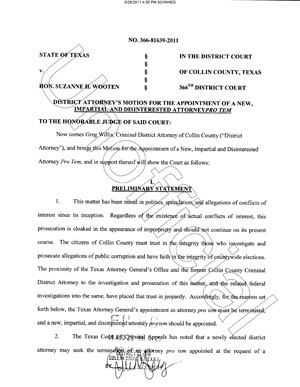 In an interesting filing, Greg Willis, the current elected Collin County District Attorney filed a "Motion for the Appointment of a New, Impartial and Disinterested Attorney Pro Tem" in the case against Judge Wooten. Regardless of the existence of actual conflicts of interest, this prosecution is cloaked in the appearance of impropriety and should not continue on its present course. About a month ago, I wrote an article Crime Victim Dies of Complications, detailing a certain tree planted in front of the courthouse to commemorate crime victims. I took a picture showing that the tree had apparently died and been cut down. I also found it interesting that no one puts up wrongly accused / convicted trees around the courthouse — that might actually cause a jury to think twice about convicting someone. 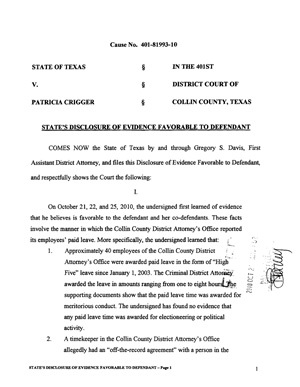 A few days ago, the State filed a motion to dismiss the cases against the Collin County District Clerks cases. It should be noted that all cases were dismissed “without prejudice.” This means that the charges could be re-brought against the District Clerks, or other charges can be brought against them as well. 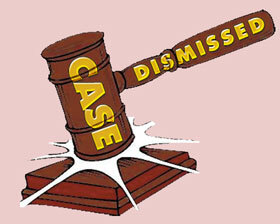 If a case is dismissed “with prejudice,” no charges can be refiled. It appears a local crime victim has dies of injuries. Reports are unclear as to whether the death is related to injuries sustained from the initial crime. 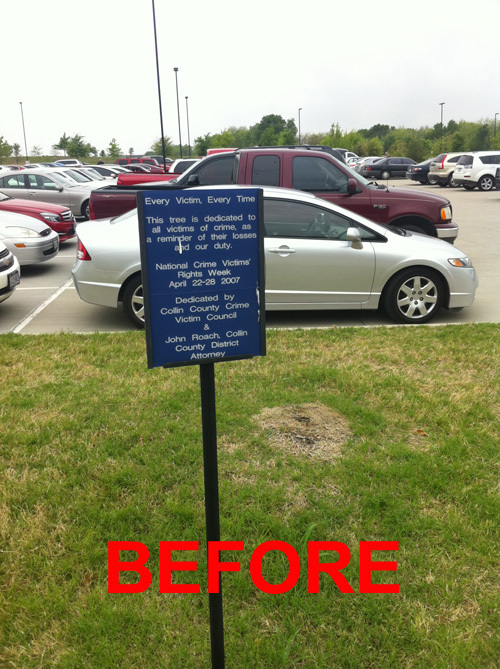 I snapped this photo recently of the "Crime Victim Tree" planted just outside of the new Collin County Courthouse. As you can see, the tree has been removed and all that remains is a bit of the stump below. The Short Answer? Admit to doing the exact same thing the people charged did. I have never had a case where a prosecutor has stood in front of a large group and admitted to driving while intoxicated — or any other crime for that matter. But that seems to be exactly what the elected District Attorney in Collin County recently did. No, he did not admit driving while intoxicated, but instead stood in front of the county commissioners and asked for assistance on properly "coding" his Hi-Five Paid Time Off program. 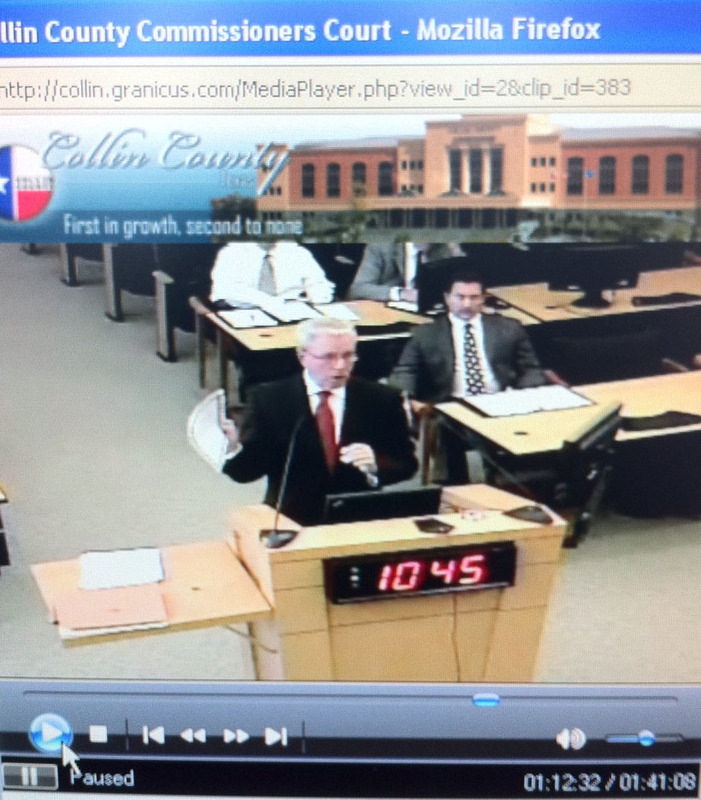 A program that on its face seems to be doing the same thing he accuses Six Collin County District Clerks of doing. Taking time off from work with the permission of their supervisors, but putting in with the county that they were actually present so they can be paid.